Steven Soderberg (Ocean’s Eleven, Contagion) takes the wheel in his latest Directorial effort in this Crime/Drama/Thriller featuring Rooney Mara (The Social Network, The Girl with the Dragon Tattoo), Jude Law (Sherlock Holmes, Gattaca), Catherine Zeta-Jones (Playing for Keeps, Rock of Ages), and Channing Tatum (Magic Mike, Fighting). 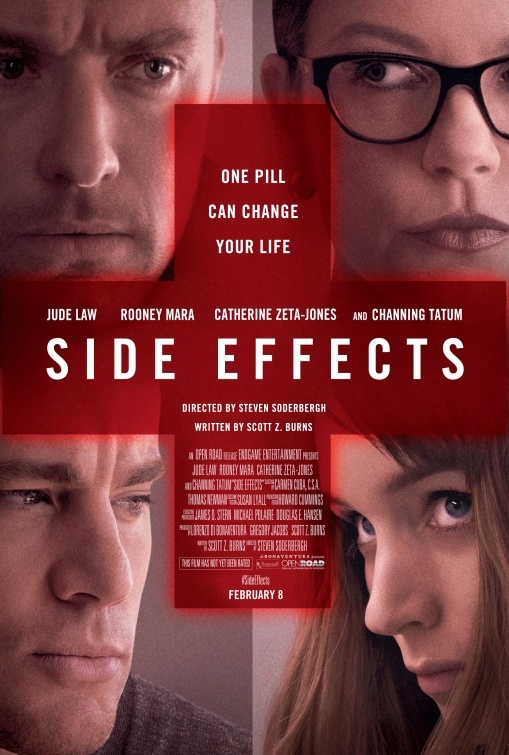 “Side Effects” follows Emily Taylor (Mara) who is a heavily depressed individual. Her husband, Martin (Tatum) has just been released from prison for some shady business deals he took part in. They are trying to put their lives back together. In the meantime, Emily has an episode of dangerous behavior and begins seeing Dr. Banks (Law) who works through some of the behavior she has been experiencing. He learns that she has had a history with another Psychiatrist, Dr. Siebert (Zeta-Jones). As Emily and Dr. Banks work through some of her issues, he finds it necessary to prescribe some medications so that she can better handle her sleepwalking, and mood swings, which have become an issue big enough to require close attention. What ensues takes all involved by storm, and the side effects of Emily’s medication may cost her her freedom and maybe even her life. There are enough twists and turns in this plot to dizzy even the most frequent of movie-goer. Rooney Mara absolutely commands your attention as the secrets of her life unravel, and she deals with the impact of her decisions. She has an intoxicating impact on the viewer as she completely sells the inner workings of the mind of a highly troubled individual. This role reminded me, at moments, of her amazing performance as Lisbeth in “Girl with the Dragon Tattoo“. Not all actors can hold that kind of control over such a long period of time. There are moments when you don’t believe in what they are going through. That is not the case here. Emily’s interaction with her Psychiatrists is complicated, to say the least. It makes the viewer question the motive of people who practice this kind of work. I am not suggesting that this film begs the viewer to question their own doctors, but it is nonetheless, an interesting question to pose as we live in a highly medicated society. The rest of the cast offer something noteworthy, but are most definitely sidelined by Mara’s performance. The story worked well for me, and at times, I was taken by surprise with different twists in the plot. The end of the film is a kind of fireworks show, in that it just doesn’t quit. We get hit with revelation after revelation, which brought some important points forward. Soderbergh does a great job of getting the audience in the mind of the films characters. It brings on a a feeling of being under the influence of medication the way the viewer is never quite sure of what is happening, and what might happen next. I always look forward to a good movie. This film is not for everybody, but it does offer some solid-enough performances (especially from Mara) and an interesting enough story to keep someone interested in this genre, scratching their head for a couple hours. For those people, this may be what the doctor prescribes.